What's it about? 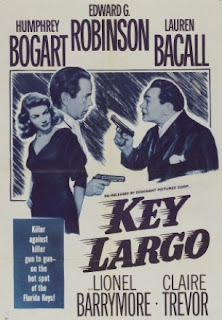 Humphrey Bogart plays an ex-soldier visiting the wife (Lauren Bacall) and father (Lionel Barrymore) of a fallen comrade in their hotel in Key Largo. Unfortunately, the hotel has been chosen by gangster Johnny Rocco (Edward G Robinson) and his gang as a rendezvous point. When a hurricane strikes, it traps them all together in the hotel and as the storm outside escalates, so do the tensions inside. Is it any good? It is pleasantly surprising to find that this is much more than a mere Bogie & Bacall vehicle; in fact, the romantic angle between the two leads is played down considerably. Instead, the fantastic screenplay rounds out each character and diplomatically gives each actor their moment in the limelight, but never seems to be forced or to contain superfluous action. There's also great use of the tight location, which heightens the tension and claustrophobia of the situation. And best of all, we get an absolutely brilliant performance by Robinson as the truly menacing, yet charismatic, Rocco, who fleshes out a potentially one-dimensional character into a great screen villain (inspired by real-life gangsters Al Capone and Lucky Luciano). In a film where nobody puts a foot wrong, he still bestrides it like a squat, pug-faced colossus. I don't trust you. What do others think? Generally overshadowed by that other Bogie-Bacall classic The Big Sleep, but Key Largo offers just as much entertainment and the added bonus of a plot that doesn’t require you to lie down with brain fatigue afterwards. And it was immortalised in the classic 80s ballad by croon-meister Bertie Higgins – how many films can claim that, I ask you? Anything else I should know? Bogart and Bacall first met on the set of To Have and Have Not, in which the 19-year old Bacall made her sizzling debut, leaving 45-year old (and married) Bogart smitten. Indeed, so alluring was Bacall in that role that (also married) director Howard Hawks fell for her too. When Bogart beat him to the prize, he jealously claimed that Bogart fell in love with the character rather than Bacall herself, so she had to keep playing it the rest of her life. Miaow!